How sad that this is the final issue. Please will you hand me an un-moistened tissue? Batman may cry. Booster Gold may die. And the rest of the gang will most probably move to Mogadishu. Well, it is a nice place. Plus I'm sure that these chaps will go there soon. Writer: Dan Jurgens; Artist: Aaron Lopresti; and Publisher: DC Comics in September 2012. Without a shadow of a doubt, this last issue of Justice League International -- entitled 'Final Honours' -- reminds me never to get buried in an unprotected military Russian cemetery. Well, you just never know whose going to damage your headstone, do you? 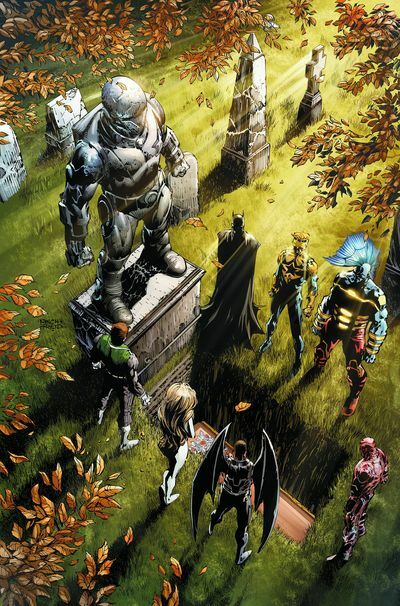 You see, all the JLI wanted to do, was to pay their last respects to one of their fallen comrades, Rocket Red. But could they do that without incident? Like Stalin they could! For a start, Malik, the twin-brother of the dead Lightweaver, attacks them unawares. Plus to add insult to injury, Batman is lurking in the shadows, ready to pass final judgment on all in sundry. Could be worse though; it could be the last in the series? D'Oh! To be continued in the annual. GENERAL: Where here to honour one of our fallen. Do you care to know how he died? GUY: I'll be glad to clue him in. Your brother was the one responsible. Happened in the bombing at the United Nations Building. If not for them -- for your brother -- Gavril Ivanovich would still be alive today. Ohh! Powerful stuff, huh? Much better than a punch in a face. I was happy that this 'last issue' didn't feel like the last instalment of this group. Personally speaking, I have enjoyed witnessing the team's dynamics grow by the page, and am glad that it hasn't been cast aside for the sake of closure. It was slightly irritating to hear Booster say that 'This was the end of this team', without adding any substance to his statement. It felt formulaic somehow -- disposable even. STORY: I know that this isn't the most innovative thing I've seen in a story, but I've always enjoyed watching a fight in a cemetery. Maybe this has something to do with the solemn-ness of this location, compared to the brashness of the action. Perhaps? Also, as I stated previously, the Malik 'talk-down' was something I thought was both positive and clear in the execution. Good one, Dan. ART: This is the best Aaron Lopresti artwork I have seen on this book yet. Less saturated. More intimate. And only dynamic when it needed to be. Good on you Aaron. Shame you saved the best till last. BATWING: ... where as everyone's favourite fourth Dark Knight, Batwing, has to be... errr... well... hmmm. Oh! I'm not too sure really. Not Mickey Mouse. And Pluto is a positively out of the running. What about Darkwing Duck? As they both have wings!!! Is This The 'Last Hurrah' For The JLI? Or is it the 'First Bar Mitzvah' For Booster Gold? Hint-Hint! The tone to this parable was earnest, poignant, and slightly dynamic in nature. Just like the Sting song 'Every Breath You Take '. Relevant in more ways than one, right? What a shame. I had such high hopes for this series when it first came out. The characters had history. The pretext had merit. Plus it had the fans backing as well. However, the creative team did have a hard time finding their own footing, and the tone of the book was too 'child-like' compared to some of the other incarnations of this team. Still, you know the old saying, don't you? "Its not goodbye, it's until we meet again" -- because I'm sure we will see the gang back in the funny pages in the not so far distant future. Now it I may, I would like to leave you with a quote made by Albert Einstein "Learn from yesterday, live for today, hope for tomorrow. The important thing is not to stop questioning".